The Pelham Committee, was appointed by the Board of Trade on 28 March 1916. Its remit was to try and find suitable civilian occupations for conscientious objectors prepared to undertake "work of national importance", and employers willing to employ them. Its formal and briefly used title was the "Committee on the Work of National Importance", but it soon became known by the surname of its first Chairman T.H.W Pelham an Assistant Secretary at the Board of Trade. On 14 April it produced a preliminary list of suitable occupations; the list looks impressive, but bears little relationship to the work eventually undertaken by the majority of conscientious objectors who were mostly sent to work in agriculture and food production. The Pelham Committee like all other Government organisations dealing with conscientious objectors, and in keeping with the demands of public opinion, did not want them to appear "coddled" and Pelham is quoted as saying that his Committee was 'in agreement with the view that men should be placed in situations that demand some definite sacrifice from them and it is their practice to place men at some distance from their homes'. This practice of removing men from the areas they lived in was not imposed on the majority of the 22 Deptford and Lewisham conscientious objectors known to have served under the terms of the scheme. Sixteen COs are known to have worked locally and only two at some distance, while the workplace addresses of four are unknown. In these cases Pelham Committee recommendations appear to have been followed, with one exception. 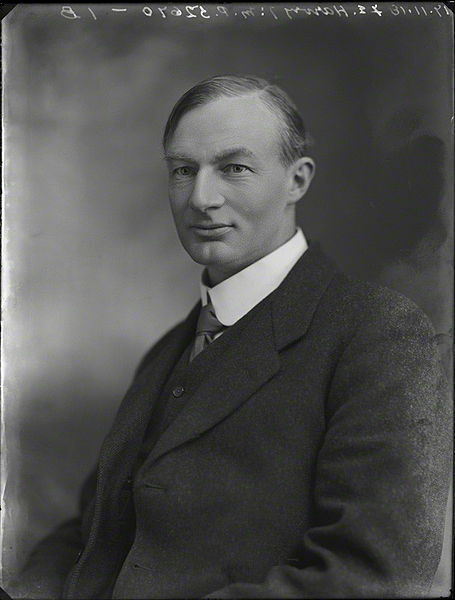 The photograph is of Edmund Harvey (1875-1955), a Quaker and pacifist MP, who played a leading role in drafting the clause in the Military Services Act dealing with work of national importance. He was a member of the Pelham Committee and he also took up the cause of conscientious objectors in difficulties with the authorities as he did in for Arthur Raitt. According to Hansard 10 May, 1916, application to the Committee could only be made through the Tribunals, but the Pelham committee had no statutory powers and could only make recommendations to the Military Service and Appeal Tribunals. The London County Military Service Tribunal, therefore, seemed to find nothing odd in referring a man to the Pelham Committee for a decision and then over-ruling that decision for one that looked less wise; as when they sent Joseph Lardent, an optician, to work as a farm labourer in Basingstoke, rather than in the Eye Hospital as the Committee had recommended. Meanwhile, the Lewisham Military Service Tribunal often rejected the requests of men like Arthur Taylor who hoped that they would be allowed remain in their current occupation and did not refer them to the Pelham Committee. The Kentish Mercury and Lewisham Borough News also reported the Lewisham tribunal questioning applicants' consciences on quite a number of cases and asking why they objected to military service when they worked for the Government in any capacity, or in a bank handling war loans or even because they were willing to sell buttons to the army. To be able to assign those seeking work under its auspices, the Committee also needed employers willing to offer work to conscientious objectors. Farmers, who did not like using using men sent by the Home Office Scheme were more willing to use men exempted by the Pelham Committee and nationally a total of 1,064 out of 2,545 men assigned work were assigned to agriculture; in contrast a total of 42 men were assigned to municipal and public utility. Here the the Metropolitan Borough of Lewisham's response to a request from the Pelham Committe that they consider employing conscientious objectors in their sanitary services section is pertinent. In reply they informed the Pelham Committee in May 1916 that they were 'strongly of the opinion that the channels of Local Government service should not be made the means of providing an asylum for conscientious objectors'. Four men from Lewisham and one from Deptford were allowed remain in their current occupations. Overall, the Pelham Committee allowed 1,046 men to remain in their current occupation, the largest number 301 worked in government controlled establishments, and only 14 were allowed to remain in agriculture. There is a report in the Lewisham Borough News July 7, 1916 under the sub-heading "Farm Work for Conscientious Objector" about a Mr H. Harrington, a Christadelphian, who was assigned work with Mr. Perry, a farmer of Southend Village, Catford. Mr Perry then had to appeal to the Lewisham tribunal to retain the services of his son William Perry, who was married with one child. Of the 3,964 men referred to the Pelham Committee the largest single religious group totaling 1,716 were Christadelphians. Frank Jannaway of the South London Ecclesia negotiated directly with the Army Council and in August 1916, the War Office and the Central Tribunal arranged for all Christadelphian cases to be referred directly to the Pelham Committee and in total 1,400 of its objectors were granted exemption by the Army Council, with local and appeals tribunals accounting for the referral of the remainder. Note: On 17 January 1917 Colonel Sir Hildred Carlisle was appointed Chariman in succession to the late Hon. T.H.W. Pelham. The tag eventually 'work-of-national-importance' lists all those from Lewisham and Deptford who served under the provisions of the Pelham Committee or who hoped for exemption under its terms and can be accessed by clicking on "Tags" in the navigation bar to the left. Harvey, T. Edmund, Temp Mss 835, includes correspondence with conscientious objectors and minutes of the Pelham Committee meetings and can be found at the Library of the Religious Society of Friends (Quakers), Friends House, 173 Euston Road, London NW1 2BJ. The minutes of the Committee often hold only very brief details of the applicants referred by the Military Service Tribunals to them. 5. The Pearce Register of British Conscientious Objectors database. John Rae, Conscience and Politics: The British Government and the Conscientious Objector to Military Service 1916-1919, London OUP 1970. Owned by the National Portrait Gallery and made available for use under a Creative Commons license.